Rollei dr5 is the latest model from Rollei. The Rollei dr5 redefines the concept of the "go-everywhere camera". With 25 mm, it is not only ultra-flat and will therefore fit any shirt pocket without a bulge, but its neat metal body also makes it a pleasure to look at. However, the Rollei dr5 has more to offer than a mere good look: Instant readiness and minimal shutter lag makes it an ideal candid camera. The Rollei dr5 with its wealth of practical features and sophisticated technology is available from March 2005 for Euro 299. While the Rollei dr5 is thrifty when it comes to size, its technical features are impressive: It comes with a high-performance D-VarioApogon HFT zoom lens with focal lengths from 4.6 to 22.2 mm (equivalent to 28-135mm in 35mm photography). 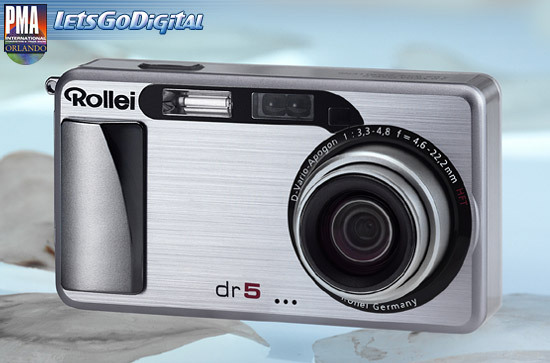 The Rollei dr5 has a powerful 5-megapixel CCD. Its 4.8x optical and 3.6x digital zoom will capture even far-away subjects in impressive size. An optical viewfinder allows rapid framing. Alternatively, a brilliant 1.8" LCD monitor may be used for both framing and displaying subjects.The Rollei dr5 digital camera is very flexible above all in the close-up range, allowing photographers to take fascinating close-ups from as near as 1 cm to 13 cm from the lens. Focusing may be either manual or automatic, with the additional option of varying the focus zone. But close-ups are only one of the strong points of the Rollei dr5. Thanks to its instant readiness, Rollei dr5 is ideal for spontaneous candid shooting and capturing elusive subjects: It is ready to shoot in a mere 0.8 second. And its shutter lag is no more than 0.10 second. In addition to single frames, it also allows continuous shooting to capture complex motion sequences. A self-timer mode with either 2s or 10s delay gives additional creative freedom. As for manual control options, the Rollei dr5 leaves nothing to be desired. Exposure can be controlled either by programmed AE or compensated manually over +/- 2.0 EV in 1/3 increments. The Rollei dr5 offers evaluative 256-zone metering plus center-weighted average and spot metering. In addition to automatic white balance, there are manual presets for sunlight, cloudy, tungsten and fluorescent. The built-in flash will automatically compensate output at close range and has red-eye-reduction auto and fill-flash modes as well as slow sync, leaving photographers ample choice when the light is low. But the Rollei dr5 will also record brief video clips, complete with sound. Video clips in QuickTime Motion format can be recorded with two different quality levels: with 640 x 480 pixels or 320 x 240 pixels. Video and photos are stored either in the internal 12MB memory or on an SD or MultiMedia card. Since the Rollei dr5 also supports PictBridge, pictures can be directly printed on a suitable printer. And if you just wish to view your pictures or edit them at a later date, simply connect the camera via its USB or video port (NTSC, PAL) to a computer or TV set. The power supply of the Rollei dr5 also is very flexible. The Rollei dr5 will operate on either two NiMH or NiCD batteries (size AA, 1.2V), two alkaline batteries (size AA, 1.5V) or a lithium-ion block (3.7V/1,800 Ah).